Because, probably, only two people have ever been indefinitely imprisoned by the United States. And they were, probably, some WHITE DOODS, right? 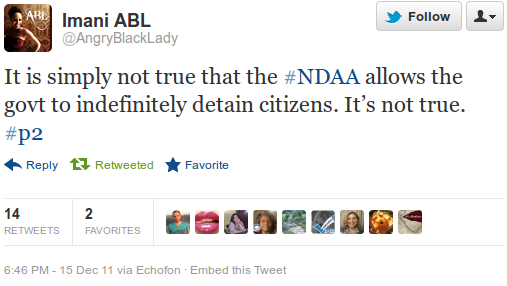 This entry was posted in Guantanamo Bay, Lack of self-awareness watch, NDAA. Bookmark the permalink. you are debating a moron and a liar. Is this all the lesser-evilists have left at this point? 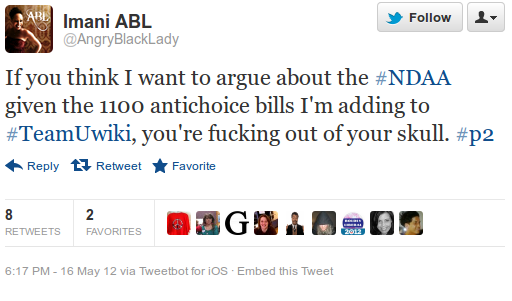 I would have assumed that the moniker "Angry Black Lady" would be for a person of a more radical persuasion. What is she angry about at this point? That POTUS still has to issue executive orders and doesn't (yet) have an "Easy Button" on his desk to eliminate nameless targets around the world? "What is she angry about at this point? "That every single person in the world doesn't agree with her exactly on every single issue. Dear Anonymous – exactly!Tho as James Altucher often says, when you get into the mud with a pig, you just end up making the pig happy while ruining your clothes. 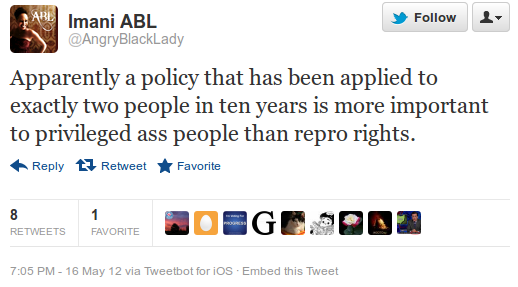 I'm glad someone is engaging/ exposing these lunatic Obama fundamentalists, tho. It's truly something to behold. If she's so concerned with reproductive rights, why isn't she tearing Obama a new one for telling us feeble-minded womenfolk that we can't have Plan B over the counter?Never mind. Rhetorical question. Great post! It's maddening to watch these people try to defend their superhero in the White House. But his policies speak for themselves. Unfortunately, he isn't who he campaigned as in 2008. It's easy for so many to want to love Barack Obama –he's a smooth talker, he's got a beautiful family–but he's a dangerous psychopath who, like Bush, doesn't really care what anybody else has to say. Awlaki's 16 year old son getting taken out by a predator drone strike is wicked. The Yemeni missile strike that the US denied, until Shaye exposed it for the world to see. That's Obama's work. That strike killed dozens of women and children. I'm baffled how anybody can defend that kind of terror.But they do. Again and again. Because Mr Obama looks nice. Speaks well. Great post! I'll be checking back. Simple answer is that she's black, and a vast majority of black people do not want to see anything negative about "their" president–which is ironic because his administration has NOT lifted a finger to help black folks at all. Many are just too full of pride that "one of us" is in the White House, so they willfully refuse to see him as less than a god.And it's truly ridiculous. And infuriating. And ultimately, sad. @ C.a.D. : your simple answer is inaccurate: there is a high rate of discontent among the black community with Obama, and an increasingly clamorous demand that he do more for their community and the 16-17% unemployment rate among blacks. but it's clear the alternatives are even less interested in helping them.